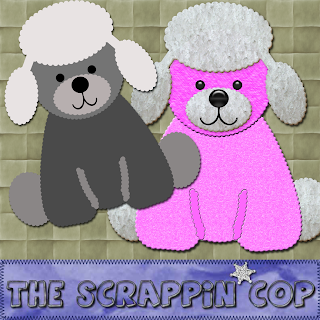 The Scrappin Cop: CU Poodle Layered Template! Hello all! Everyone seems to like this silly templates that I am making so I will keep cranking them out for awhile. I had a request on 4shared for a poodle, among other things, so I spent this evening working on this little sweetie. I included the Googley Eyes with the download but I think she looks better with plain eyes. You can decide what you like best! I was laughing the other night - I think I have some blog stalkers. I uploaded my little guys and posted them on the blog and then went back to edit something just a few minutes later and there were already a couple of downloads of them! I'm so grateful for your support! Thanks for all the wonderful comments! All your templates have been great!! My mom always had poodles and we have a good friend who has a poodle puppy now, he looks just like your template, lol. Thank you so much Deb!!! Awesome!!! Again Thanks So Much. Thank you! Your blog post will be advertised on the DigiFree Digital Scrapbooking Freebie search engine today (look for timestamp: 26 Jul [LA 12:06am, NY 02:06am, UK 07:06am, OZ 05:06pm]). AAAHHHH - that is me just screaming with delight! These are sooo cute. We are Chihuahua collectors! Well - we only have 2...and that's the max. But if I could I would have 20! I just LOVE 'em!!! Thanks for the adorable poodles.